Four or five times a year, the farrier comes to trim Lulu and Fanny’s hooves. This is a cherished ritual for us on the farm, the farrier gives us the chance to make sure we are caring for these remarkable animals well, making sure their weight is good, their hooves are healthy. For fourteen years, Ken Norman was our farrier, a few months ago we needed a trim quickly, and Ken couldn’t make it. There are very few farriers and a great demand for them. We found a local farrier named Matthew Ross, and he came then, and again this morning to trim Lulu and Fanny. Life is so much about change. Matt is quiet and focused. 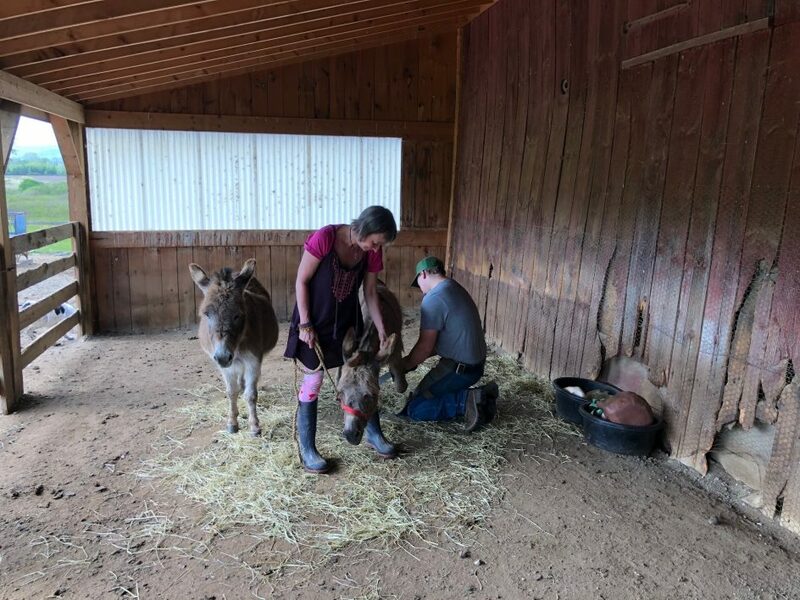 He told us the donkeys’ look great, their hooves were fine, their weight is just right, the gravelly sand of the pole barn is great for their hooves. The donkeys love Matt, just as they loved Ken, they love attention. When I first called Matt, he said he was too busy (I thought it was a blow off) and so I called him back and gave him some references. Matt is businesslike, quiet, the donkeys trust him intuitively. Then he relented, he has had so much trouble with donkeys, who can be very temperamental, that he didn’t want to trim them any longer. But he agreed to come and take a look, and he said these were the nicest and calmest donkeys he had ever seen and he would be happy to trim their hooves. So a new and valued member of the Bedlam Farm universe. Today, we didn’t even need to tie them up, they were happy to stand still for him, and the sisters stayed close to one another, in case there was trouble. Their wasn’t. I get a special feeling when the farriers come. If I didn’t live her, I would never get to meet people like Ken or Matt, who live the lives they wanted to live and chose a life with animals. I think in the country, there are more people who have callings, rather than jobs. I am one of them, I guess. The farriers and shearers are another. They speak for individuality and freedom in an increasingly corporate and homogenized world. Happy to know them, grateful to have them in my life.